THE NATURAL HAVEN: Does hair really not react in the pH range 4-9? Does hair really not react in the pH range 4-9? Of course I had to answer this question pronto! Thanks for the very insightful question Courtney! Q1: How do scientists know that hair does not react in the pH range 4-9? 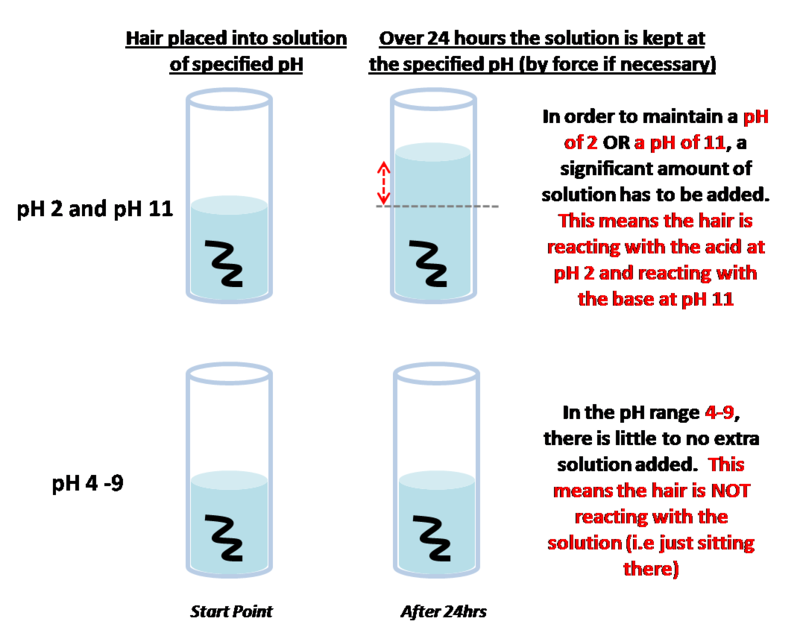 The experiment (J Soc Cosmet Chem, pp 393-405, 1981) performed was to place hair into solutions of different pH (skip to the diagram if you wish - click it to enlarge). The scientists then made sure that the solution stayed at the fixed pH. If hair started reacting with acid, the solution would become less acidic meaning the scientists have to pump more acid into the solution (and the same for high pH i.e base/alkaline). If there is no reaction then little to no extra solution is required. Suppose hair is at a pH of 5 and you then use an alkaline soap at a pH of 8 to wash it. The hair does NOT get to the pH of 8. In actual fact it may change by about 0.4 to 0.5 units (see previous post). It is not cycling from 5 to 8 but rather 5 to 5.5. Q2: Each pH unit is 100 times more powerful than the previous one. I am not sure that powerful is the right word but in essence, yes this is somewhat true (not exactly true but close enough). I could go into the ins and out of it but I am not sure how interesting that is. Yes it is true that the difference between two numbers on the pH scale is quite large but this does not mean that a pH of 5 is more powerful than a pH of 6. For hair, science tells us that a pH of 5 is no different from a pH of 6. However just to give you a different point of view, for blood the aim is a very narrow pH range somewhere between 7.3 and 7.5. In short pH is a scale that makes scientific sense and is relative to what you are using it for. (For geeks - pH is on a logarithmic scale). Q3: How can hair resist change over such a large range? This is indeed fascinating. The truth is I have not seen a good explanation of why, there is only clear evidence is that it does. Theories as to why include the role of the oil layer of hair, the shielding effect from the cuticle, the presence of certain amino acids in the hair............the list goes on. I hate to disappoint but science is like that sometimes.......more questions than answers. I can say that hair is really not that unique in this respect. There are many substances in the natural world which are designed to resist chemical attack. An example is your stomach which produces acids at a pH of 1-2 and manages to maintain its structure. To be accurate, the pH range where hair is not seen to react is 4-10. The pH 9 cut off comes because in addition to the reaction tests, the scientists performed microscopic examination of hair. Over a pH of 9, the cuticle of the hair is seen to lift. Therefore the cut off point is moved to 9. General info - The pH solutions were made from sodium hydroxide (base) and hydrochloric acid (acid). I'm now wondering what on earth Aloe Vera Juice does to my hair in that case (and the rest of my family too). Ruth - Aloe Vera Juice does indeed have a pH of around 4 to 4.5. Hair is slightly acidic too (ranging anywhere from 4 to 6). Acidic pH is not known to smooth the cuticle but using slightly acidic products does help hair stay closer to its natural range. For example the alkaline soap moves the pH by about 0.5 but using a slightly acidic shampoo moves it by only 0.2. While these numbers are very small and probably insignificant if you compare them to the 4-9 range, it still shows that using something slightly acidic to neutral (i.e 4-7) is not a bad idea. Nice post. I love that you looked at a study in the JSCC. You've explained the study brilliantly. One line didn't exactly make sense to me however, as hair doesn't really have a pH. "The hair does NOT get to the pH of 8." pH is a measure of the amount of H+ ions in a solution. This doesn't really apply to hair. Thanks Perry. Hair does indeed have a pH (As does skin). 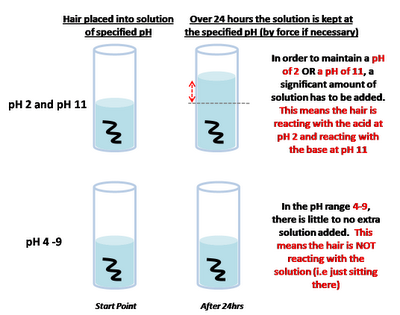 The pH is obtained by shaking some hair in water for a set time and then measuring the resulting pH. This makes perfect sense. Thank you so much for posting this, Jc! Yw Loo, thanks too to Courtney for asking the questions! Great post Jc - with so much info floating around the blogosphere, it's good to get back to basics! I'm pretty sure the small shift in our hair's pH has to do with buffers. Our body has them to keep our blood pH at an even 7.4 and I'm assuming our hair has them as well. Make a youtube channel please! I hate reading but you're interesting so... yea..